This slot is easy to play, and the symbols on your reels all almost seem identical, apart from the wild symbol. There are some differences to be noted in the colors of the skulls, as well as in some of the shapes of the skulls: some are obviously more feminine than others. The goal of this slot is simple: make sure the band produces as much sound as possible! Each time you land symbols on a pay line, there will be singing. Because this slot uses avalanches, the so-called falling symbols, your wins can increase rapidly. And especially so if you keep a close eye on the multiplier in the bottom of the screen. 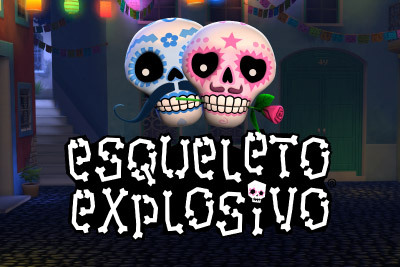 Esqueleto Explosivo is a slot with five reels and four rows, developed by software developer Thunderkick. The game functions slightly different from most other slots as there are no spinning reels but falling symbols. 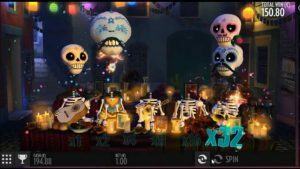 On your playing grid, you will encounter a plethora of painted skulls, like skulls one would usually associate with the Day of the Death in, amongst other countries, Mexico. The slot has strong musical features and with each win, you will get flooded with music. It is a really catchy slot you will want to play again. Esqueleto Explosivo is a slot with seventeen pay lines. This number of pay lines is nothing new for developer Thunderkick, but it is a great amount for this slot. That is, there’s a lot happening at the same time. The avalanches set the multiplier in the bottom of the slot in motion, which can amount to x32! Imagine what a big win with a decent bet could amount to with such a multiplier! Also when playing this game with the sound off, you’ll know when it’s time to celebrate. There are confetti and fireworks for all winning combinations and that works quite uplifting. Also, the background music in this game is impressive as the band found in the background also actually plays the background music. The skeletons sing along and seem to spin around their eyeballs. The slot isn’t equipped with many extras, so the wild symbol is particularly interesting to keep an eye on. Luckily, Thunderkick is aware of this and have made the wild symbol very easily recognizable. Not only are the wilds golden-colored but also do they resemble Elvis. When the wild lands on your reels, you don’t even always need a winning combination to win. More specifically, all symbols directly adjacent to wild symbols explode and get replaced by new symbols. Thus, with each wild symbol, you get three to nine new symbols on your reels! Even though the slot isn’t equipped with a jackpot, you won’t get the feeling you’re missing out on anything while playing Esqueleto Explosivo. This game will enthrall and entertain you without breaking a sweat. The multiplier you find at the bottom of the slot will quickly become one of the things you will want to keep an eye on. More specifically, each time an avalanche gets triggered, the multiplier increases. It starts off at 1x and, as said before, will increase each time winning symbols fall off the playing grid. It moves to 2x, 4x, 16x, and, maximally, x32. After having read this, you will probably understand why the missing jackpot isn’t a problem. Wins can get phenomenal on Esqueleto Explosivo.